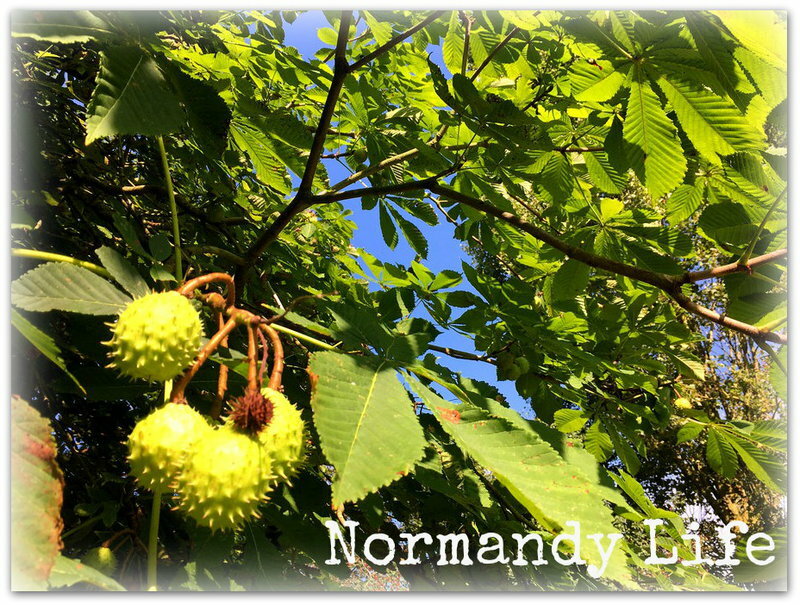 Normandy Life: Mosaic Monday # 51 - flowers and cheese. Mosaic Monday # 51 - flowers and cheese. Although the weather has been very un July like in Normandy this week my blue hibiscus is continuing to put forth amazing flowers for us to enjoy. It's such a shame that they wither and die so quickly if you cut the stems to bring inside, I shall simply have to admire them as I pass by. I snapped these colourful hydrangeas with my phone whilst at the market in Trevieres on Friday. I was happy to see that the florist had reopened after being closed for many weeks due to illness. 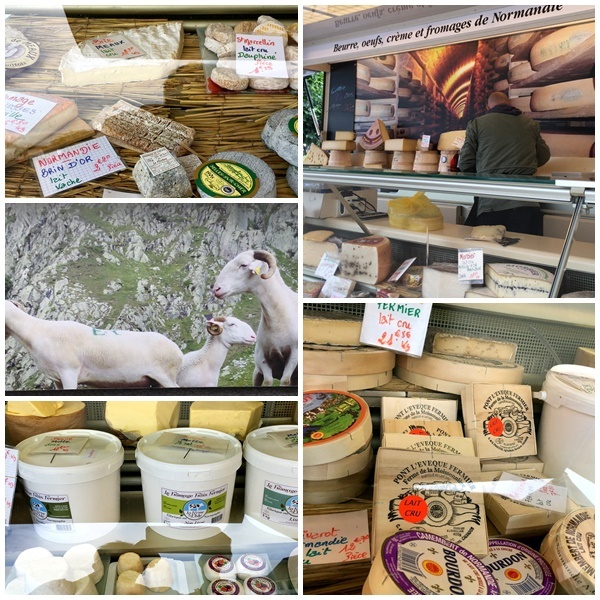 Buying fresh produce there is one of my favourite things to do, I always look forward to sampling tasty bites of fromage before deciding what to bring home to enjoy at the weekend. This time I bought a slice of creamy ripe Brie and a large slice of authentic Greek feta to enjoy in a salad of tomatoes, cucumber, olives and thinly sliced red onion, lavishly sprinkled with oregano and drizzled with Greek olive oil which I brought back from our trip to Crete in May, delicious! 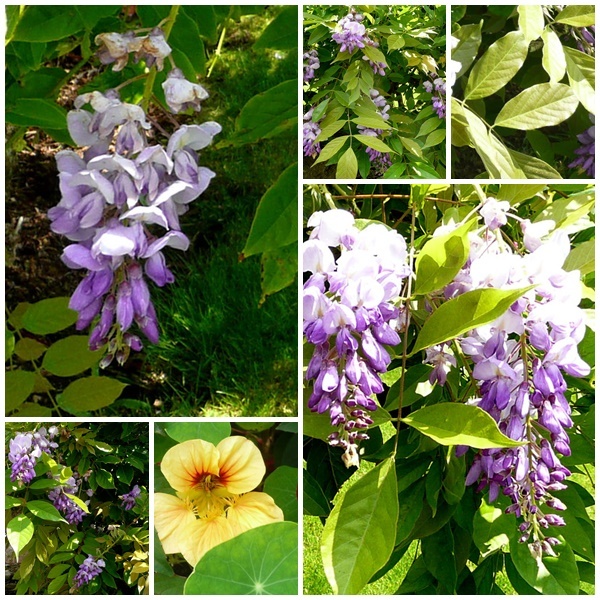 My wisteria is covered in large blooms for the second time, we enjoyed it's sweet perfume in May and here it is again, a delight for all the senses. The swishing sound it makes when a strong breeze passes through causing the flowers to swing to and fro is so romantic. A small volunteer nasturtium, a descendent of seeds bought at Monet's home, Giverny many years ago, peeps through the low lying foliage and adds a sweet contrast. 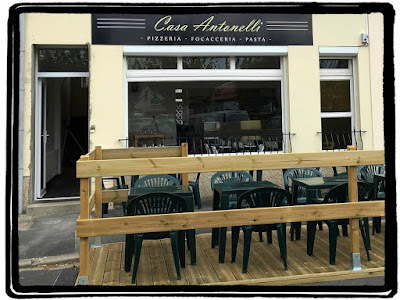 Whilst walking back from La Poste across the market place I spotted a brand new addition on the Trevieres dining scene. We're looking forward to trying it out soon. Have a wonderful vacation and a Happy August. I love the idea of the whole country taking a month off ;))! 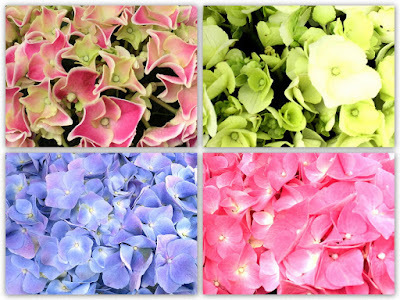 The hydrangeas in all different colors are beautiful ... I've been collecting photo samples of them around here for a possible future post, but I think yours are prettier. Love the volunteer descendent from Monets garden .... and cheese... everything in this whole post made me smile! Thank you for hosting, see you in September. Lovely flowers. 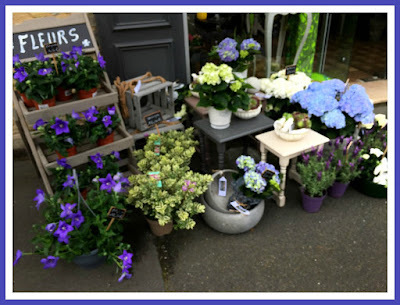 so glad the florist is well and the shop is open again. The cheeses look wonderful. I also have Nasturtium reseeding everywhere and I love it. Good Morning sweet Maggie and thank you for sharing such lovely shots ! Your flowers are lovely, Maggie, I love cheeses of all kinds and would love to taste the brie in France! Enjoy your vacation! See you in September. So many beautiful flowers! Hope you enjoy the cheese. I envy your wisteria and purple hibiscus Maggie. Wishing you a lovely holiday month! Maggie thank you for sharing your garden and the places you visit and the wonderfully fresh food you turn into meals. Have a wonderful August and we will see you again in September. Wow! Maggie -- the hibiscus is gorgeous ... all of your flowers are. Your descriptions of the cheese made my mouth water! So nice to have a wonderful market. Enjoy the new restaurant. Happy Monday and thanks for hosting! Oh yum -- I love cheese! And your flowers are splendid. Hope the new resto is a good one! Flowers and cheese, two of my favourite things, Maggie. I think I would do well if I visited your town! 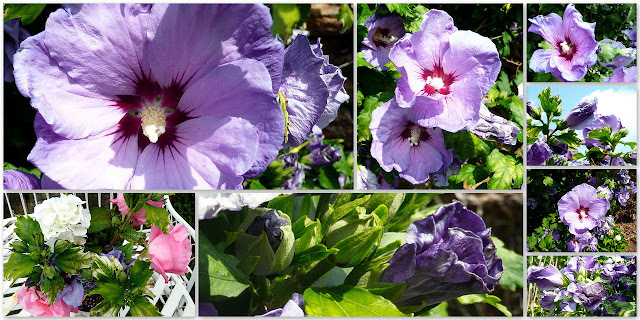 All of your flower photos are just lovely, Maggie, but that blue hibiscus is something special. Although I've just eaten breakfast, your description of the feta Greek salad, and the Brie cheese has me thinking I'd like to go to the market NOW. Have a wonderful August break and thank you for hosting MM. Hmmmm. You're shopping sounds more exciting than my shopping! Maggie, The brie sounds delicious. Thanks for sharing and have a great week. Sylvia D.
flowers and cheese and a new cafe - sounds like a perfect combination to me. Have a fabulous week. Lovely flowers! I imagine that closing and reopening a flower shop would involve loss of product and the expense of getting new flowers. Thanks for hosting us, Maggie. Enjoy your August holiday. I love hibiscus, I've tried to winter them over in the house but I tend to get little bugs. Now it's just a shame to see them die once the frost comes so I haven't added any to my summer garden. Your salads have me wanting to run out for good greens and cheeses! Thank you for the inspiration. I usually plant nasturtiums (missed it this year as I was on vacation in June). Unfortunately they don't come back each year unlike the sweet peas. Love you hibiscus. Mine had no yet bloomed. It is a late summer bloomer here, filling the gap after the summer heat has spent all of the other flowers. It's cool this morning, which feels nice after the hot days. I'll miss Mosaic Monday, but perhaps the vacation will give me time to catch up. Thanks for hosting; it is alway a pleasure to participate and fun to read the other blogs. I love the fact that you feel so grateful for your florist being better and reopening the shop, as well as how excited you are to try the new addition to the wonderful establishments you enjoy frequenting. Living in a village has taught me to appreciate our own two kafenions and one mini market. Your own flowers are pretty, and the nasturtiums from Monet's gardens must feel very special. Your hearty Greek salad, sounds so appetizing, and I've just had my dinner, the highlight, of course, being the Cretan Feta - yum! Looking forward to joining you this autumn, Maggie, for Mosaic Monday, again, as I imagine the upcoming season will not be as busy for me, like this summer was, which was great, mind you.